Dunbar is located 30 miles east of Edinburgh and aopproximately 30 miles north of Berwick upon Tweed with good bus and train links both north to the Capital and South to Newcastle and beyond. A town of three harbours, Dunbar was once a major herring and whaling port.Its old harbour dates from 1710. 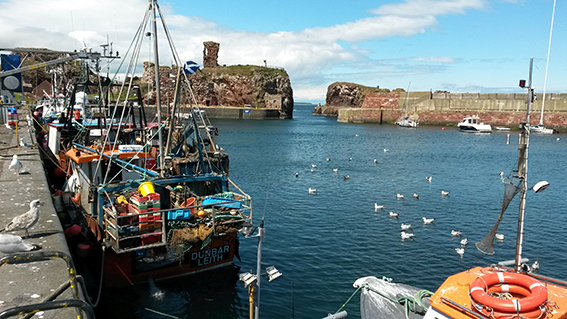 Dunbar Harbour is a busy working harbour with a commercial fleet landing mainly shellfish. The harbour is also home to one of the largest lifeboat stations in the area and there is a thriving Sailing Club and a Coastal Rowing Club as well as attracting many diving clubs to enjoy the seas around Dunbar. The old castle walls host the UK's most accesible Kittiwake colony and, if you're lucky, you may also see Sammy, the resident friendly seal, who spends his time swimming around the harbour hoping for a fish supper from the fishermen.